Combi SuperFlow addresses the problems associated with combination boilers and electrical water heating appliances that heat hot water. A Combi SuperFlow cylinder can improve the hot water output and energy efficiency of combination boilers by plugging directly into all leading makes of combination boilers including British Gas, Worcester Bosch and Vaillant. It will halve the time needed to fill baths and will save electricity used to heat water in other appliances. Combi SuperFlow works by selectively preheating cold water before it gets to the boiler or appliance. 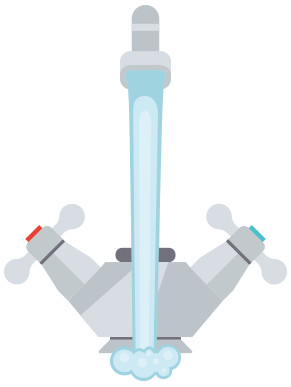 The device will raise temperatures from 25°C to 30°C, a small but significant rise to an optimum level to maximise potential hot water output, and provide flow rates of up to 20 litres per minute from a combination boiler. The temperature of the cold water supply in the UK varies from 20°C+ in the summer down to 5°C in the winter, hence the high heat outputs required of combination boilers. Combi SuperFlow optimises preheat for combination boilers so that they deliver the very best hot water output even during the coldest winter months. It’s as though your boiler is installed in the South of France during the middle of the UK winter. 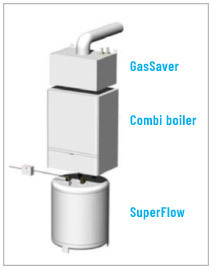 Combi SuperFlow is recognised as saving approximately 24% of the annual energy required by a family to heat hot water. This is done by reducing the volume of rejected lukewarm water normally associated with combination boilers experienced during winter months. The cylinder is available in two sizes of 25 litres, small enough to fit into a standard kitchen cupboard, or the larger 50 litre cylinder. Combi SuperFlow is the perfect boiler upgrade, saving you money on replacement boiler costs; it requires no maintenance and has no moving parts. The system is easy to install, from DIY to Gas Safe engineer; no mains electrical connections are required and it fits neatly into a kitchen cupboard. Are available with or without solar, depending on requirements.